Do you like to color? Adult coloring books are popular now, used by some as aids for meditation as well as entertainment. 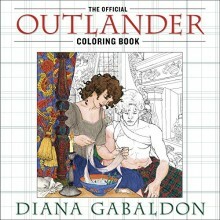 On October 27, 2015, THE OFFCIAL OUTLANDER COLORING BOOK will be released. The OUTLANDER COLORING BOOK is an "adult coloring book" with beautiful artwork depicting characters and situations from my first book, OUTLANDER, as interpreted by several talented artists. It is geared toward adults, but does not contain any R-rated images. Each image is printed on a separate page for coloring; there is no two-sided printing. This is for those who like to detach and give a coloring page as a gift, or to frame it. The OUTLANDER COLORING BOOK is not a storybook at all; it does not contain any new story lines from or new background material about the OUTLANDER series of novels. Neither is it a graphic novel like THE EXILE. From the lush green of the Scottish Highlands to the military red of a British soldier’s coat or the vibrant hues of a tartan kilt, the colorful world of Claire Beauchamp Randall and Jamie Fraser is now yours to explore. Featuring gorgeous natural landscapes, detailed drawings of Claire’s medicinal herbs, depictions of the books’ most beloved scenes and characters, and intricately rendered clothing, weapons, and armor straight out of eighteenth-century Scotland, these exquisite black-and-white images—from renowned illustrators Juan Alarcón, Yvonne Gilbert, Craig Phillips, Jon Proctor, Tomislav Tomi&cacute;, and Rebecca Zomchek—are designed to dazzle and inspire. Fans of the series, as well as lovers of history and art, can party like it’s 1743. This page was last updated on Thursday, September 24, 2015, at 5:31 a.m. by Diana’s Webmistress. What is the OUTLANDER Coloring Book?